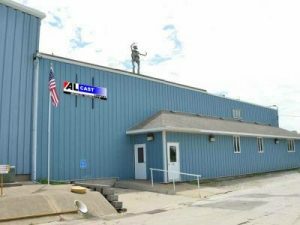 Alcast Company (Alcast) is very pleased to announce the purchase of the operating assets of Fairfield Aluminum Castings Company in Fairfield, Iowa (FALCO) along with assuming the Clarence, Missouri property on August 28, 2017. Alcast is a permanent mold foundry located in Peoria, Illinois with a sand casting operation in Galesburg, Illinois. Alcast has been in business since 1970 and has developed an excellent standing in our industry. Our philosophy is customer-focused, where we go above and beyond to serve our customers with excellent quality and 100% on-time shipping. You can learn more about Alcast and our family of companies by visiting our Home Page. Our intentions with Alcast-MW are to mend customer relationships, invest in updating the machinery & equipment, and invest in our people through training and foundry education. We plan to grow the business to better serve existing customers and new customers. We believe current FALCO customers will benefit greatly from Alcast’s influence on FALCO’s current processes and offering the alternative of producing castings on the Alcast proprietary, ELECTRO-MAGNETIC casting process. We believe current Alcast customers will benefit greatly by FALCO’s capabilities with the Hunter 32 automatic sand casting line and the Hall H6 tilt pour machinery. The combination of these two companies will give us capabilities to produce nearly all sand casting and permanent mold casting requirements of our combined current customer base and potential customers.